Today the car had to go and get fixed. The reason the car had to go and get fixed is rather upsetting. The car had to go and get fixed because I hit the front of the house whilst parking last week and broke the headlight. Oops. Originally I was going to take it to a Ford dealership. This idea was abandoned though on account of a) there isn't one very near me (at all) b) they never called me back and c) their automated phone system hung up on me. So, I took it to a local garage (well, relatively local). This occasioned me to visit a part of Woolwich I'd never been to before, south of the Woolwich Road (or maybe it is called Greenwich Road once it meets Woolwich?) and next to the Thames. It is a fairly vast industrial estate with some incongruous pockets of housing. It is also two bus journeys and a reasonable walk from my house. I probably saved at least 100% of what the dealership would have cost me though, so I'm not complaining. Having the car back in one piece I went to the supermarket for some bread. The Sainsbury's on the peninsula finally has it's new windmills up. It had been some months since the old ones were taken down. The new ones are pretty cutting edge. Instead of the old vertical faced blades these have twisted blades in a column. 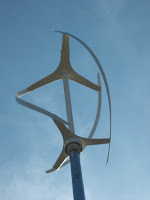 This means that the windmill doesn't need to turn to face into the wind, and doesn't need such a long free air corridor to operate. It also allows it to operate at lower speeds. Sainsbury's, however, don't seem to have turned their new windmills on yet!